© Alexander Historical Auctions Hitler and Rosa during a summer day in June 1933. 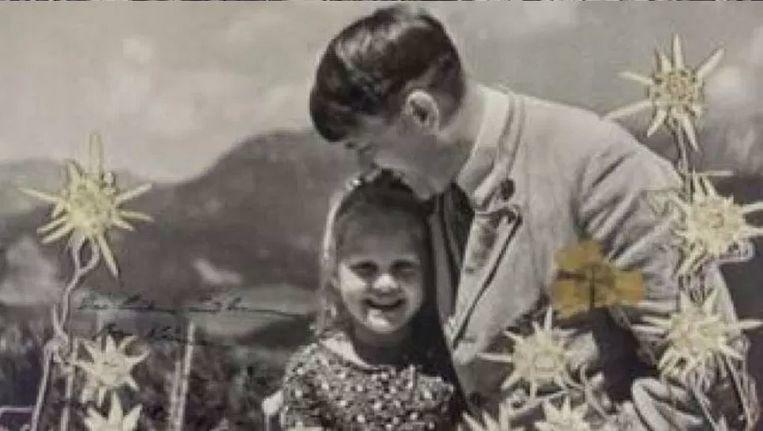 Hitler sent the signed (lower left) version of the photo to the girl. She then probably decorated the photo with flowers. At first sight, the image of a man embracing a radiant young girl seems like a scene of pure summer happiness. But behind that apparently carefree facade is a completely different picture: the man in the picture is Adolf Hitler, who would kill six million Jews. And the little girl is Rosa Bernile Nienau, a Jewish child. Rosa Bernile Nienau and Adolf Hitler met in the summer of 1933 and built a remarkable friendship after it became apparent that they shared the same birthday. Rosa and her mother were initially waiting in the public at Hitler’s summer house in Bergdorf in Bavaria that summer. When the politician learned that the little girl had her birthday on the same day, April 20, as he did. Hitler then invited Rosa and her mother Karoline into his house on top of the mountain, where the photos were taken. Not long after it was discovered that Karoline’s mother was Jewish, which made Karoline and Rosa also Jewish in the eyes of the Nazis, since Judaism is basically passed on through the mother. Yet Hitler continued the friendship with the girl. And sent her a signed copy of the photograph, which he signed and dated 16 June 1933. Rosa later added her own stamp to the photo and drew flowers on the black-and-white photograph. Between 1935 and 1938 the girl wrote no less than 17 times to Hitler, until she and her mother were requested by Hitler’s private secretary Martin Bormann to stop contact. “Hitler did not like this”, says photographer Heinrich Hoffmann, who took the snapshot. “There are people who have a real talent for the elimination of all my pleasures,” the photographer remembers Hitler’s reaction. The year after the contact between Hitler and Rosa was broken, the Second World War broke out. At the end, six years later, six million Jews had been killed. Rosa did not survive the war either. When she was seventeen she died in 1943 in a hospital in Munich in Polio, ten years after her first meeting with Hitler.